Let’s take a break from current controversies and return to those sepia toned streets of a hundred years ago. 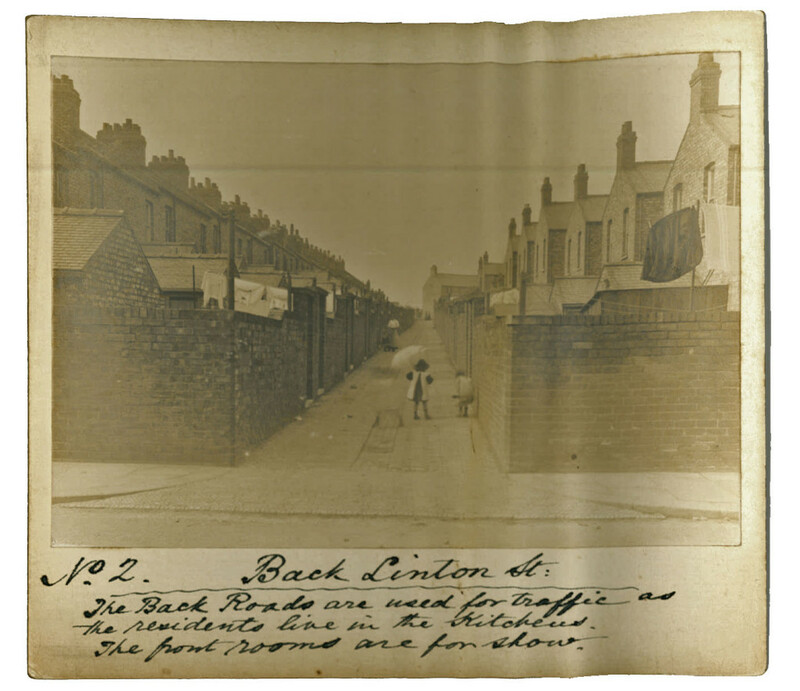 We’re in one of the areas of terraced housing off Poppleton Road, just around the corner from the photo included on a recent page. These back alleys are ‘used for traffic’, in the days before motorised, fast-moving traffic. Children play and the backyards are full of washing drying on the line. I think this is taken from the same end of the alleyway, but I’m not entirely sure, as these back lanes look very similar from either end. Or at least they did then. The intervening years have seen many changes, as we’d expect. Many of them a result of increased car usage. Here a garage takes up most of the old yard space. 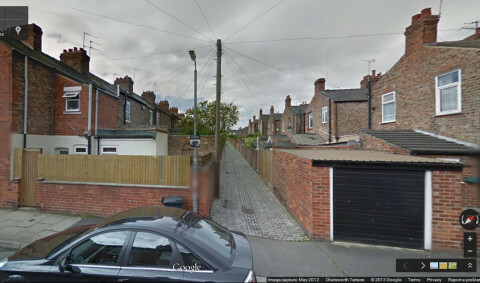 The house on the left has had its yard wall reduced in height and an extension built. There’s a bit more greenery, including a tree or shrub growing in one of the yards. A telegraph pole’s phone wires connect to each house. A neighbourhood watch sign near the entrance to the alley reminds us that things have changed a lot since these times when you could (as people so often assert) safely leave your doors unlocked. The most obvious feature still remaining – the stable paviours in the back alley. A hundred years ago the alley also had setts neatly laid across its entrance. These have since been removed or been lost under tarmac. This batch of fifteen photos has a common theme, better illustrated by the notes on the later photos. The photographer appears to have been recording the state of the roads and pavements. Number 3 photograph was taken just around the corner, on Amberley Street, the road running parallel to Linton St and its alley. Any mention of Amberley Street has to include mention of the damage it sustained, and the suffering here, on the night of the Baedeker raid in 1942. It’s not obvious from this image, but if you walk down Amberley Street and look carefully at the houses you’ll notice that a few of them don’t match their 19th century neighbours. On 29 April 1942 several bombs fell on Amberley Street. 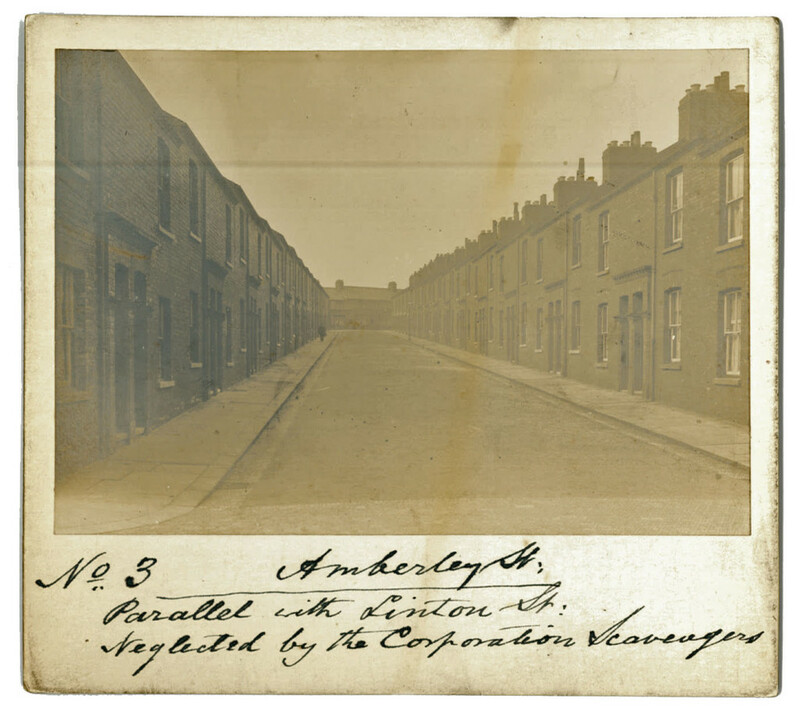 Many York streets had a number of houses hit and many casualties, but Amberley Street lost the most. 14 people were killed, including a small child. Five of the casualties were from the same family. Looking peaceful and quiet, pictured decades earlier. Nothing much of note, except the curious comment. This image, like the others, is included in the city archives online collection as (c) City of York Council – in earlier times known as ‘York Corporation’. I always thought it was a bit odd that one of their own photos had a caption with the accusation ‘Neglected by the Corporation Scavengers’. It’s clearer now I know that these photos are part of the Fairbank archive. Fairbanks were a firm of civil engineers based in York. 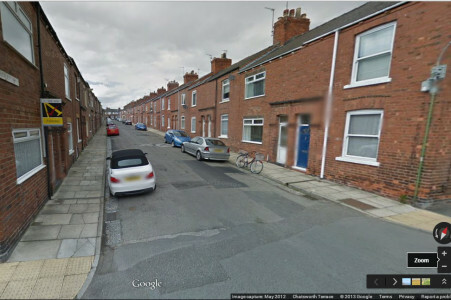 Obviously Mr Fairbank wasn’t too impressed with the local authority’s upkeep of this street. ‘Scavengers’ is an odd choice of word, suggesting that the Corporation had been stealing bits of paving from Amberley Street. Or perhaps Mr Fairbank was just complaining about a lack of maintenance of the road and paths. Perhaps ‘scavengers’ was used more as a general non-specific kind of insult, back then. So much has changed over a hundred years, but in other ways it’s not that different. Back then, and now, residents of the city complain about ‘the Corporation’. This gentleman expressed his exasperation with the council in a caption on a photograph, whereas now we have Twitter. ‘Scavengers’ were waste collectors – it’s a term I’ve mainly seen referring to the C19th. The street looks OK to me – perhaps Mr Fairbanks was a man of high standards. My C20th working class culture consultant reckons that that top picture would have been taken on a Monday, because it’s clearly washing day. You’re right, of course, thank you. I think my brain was still stuck in King’s Square, and too focussed on paving. I should have looked at the dictionary definition (number 3) and also this is quite interesting, from grammarist.com. Good point about washing day too. Doing the laundry back then sounds like a long and tedious chore. Let’s all give thanks for the invention of the automatic washing machine. As you say,no such problem these ‘soft’days. Hi Lisa,You are simply great! Wish I could do what you do,fantastic,insight into everyday life. Wondered whether you could take a look at the Water tower opp Poppy Rd school? I believe it’s not used anymore and is potentially an sis and building site.It would make a lovely park if it was opened. Thanks for your kind words Keith, and happy new year to you too.